Listen to our Valentin'e’s Day picks and enjoy the love in the air! Perfect to keep the spirit of Valentine’s with you all day! Follow us on Spotify for more playlists. Keep an eye on our Instagram, Facebook and Twitter for music updates! We are so thrilled to welcome our next artist Molly Spell Artz of Spell Garden Design to Quirk for our Garden Arrangements Workshop! In this workshop Molly will go over how to source from your garden while incorporating outside elements from local markets. We are so looking forward to spending this time making beautiful arrangements, learning all the tips and tricks, and taking in as much as we can from Molly's knowledge from landscape design to garden maintenance and more! Spell Garden Design: I’m a garden designer living here in Richmond. I’m also mother of a three year old and love spending time outside in my own garden, cooking and hanging out with my three pet ducks. When did you start your company Spell Garden Design? I started my company last year after doing garden design, maintenance and installation for a few years. I decided using my art background might be a chance to stop wheel barrowing loads of mulch up and down hills. Though I am quite diesel. I still maintain a few gardens, mainly as an excuse to play in the dirt. Working within the horticultural and design field is something that runs in your family - your father Bill Spell was a renowned landscape architect. How did this affect you growing up and inspire your current style with Spell Garden Design? I have always been so proud to be my father’s daughter, but it wasn’t until he was gone that I was truly able to appreciate his work. My dad was a total boss. He designed the plaza around the Kugel Ball in front of the Science Museum of Virginia, which is probably one of the coolest projects that I get to enjoy whenever my son and I go there. I think my style is still being developed, but I’m way more into perennials than my dad was – he was a woody plants kind of guy. I want to introduce more plants that cover the ground so weeds can’t thrive, all while blending various shapes, textures and blooms throughout the seasons. I also try to consider pollinators and birds when choosing plants, and I hope that my designs will inspire other gardeners to do the same. What are the projects that currently excite you the most? Workshops? Full scale redesign of gardens, yards, etc? I really enjoy garden consultation. I love going into a garden and problem solving to begin coming up with a plan to enhance a space. When a consultation turns into a design is always really exciting too! Can you talk a little bit about why you want to teach this workshop? One thing I really love about having a garden is bringing bits of it inside over the seasons. We always have something from the garden to enjoy on the dining room table. Usually I focus on interesting foliage from my garden and throw a few blooms in that I feel like I can spare. 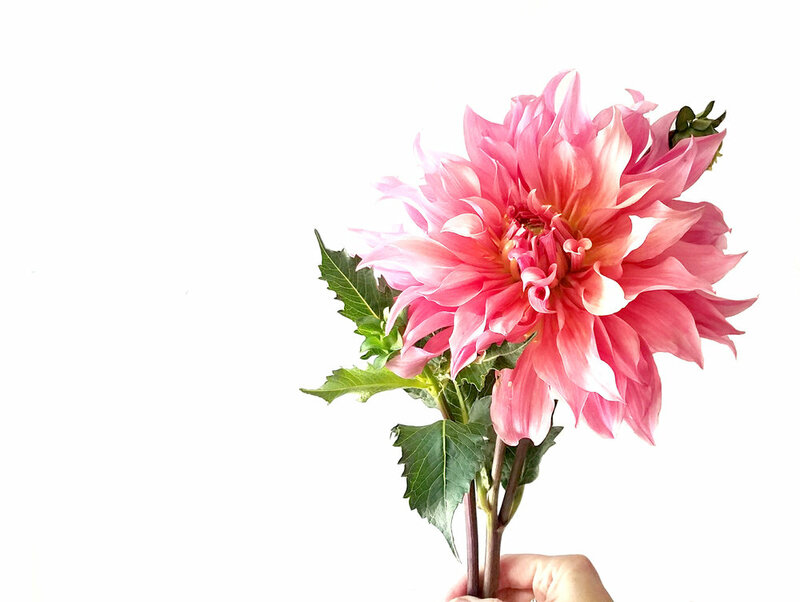 But I’m also really excited about the flux of cut flower farms I’m seeing in and around Richmond, and am hoping to incorporate some of these gorgeous blooms into the arrangements we’ll be making in the workshop. I think this workshop will be helpful for anyone who wants to get creative arranging with cuttings from their own garden (or friendly neighbor’s) and learn which plants can be used to enjoy both in the landscape and inside the home. What is next for you and Spell Garden Design? More garden design! I’m looking forward to seeing more of my designs installed and to watch them mature. And more collaborations. With owning a business, I feel like I’m suddenly part of this awesome club of small business owners, and we are finding ways to work together. Keep an eye out for projects with local makers and growers! With this up and down weather we are ready to welcome spring. This is your perfect spring soundtrack to take a drive with the windows down somewhere warm and in bloom. Quirk Gallery: Hello again! As a refresher for anyone who didn’t see our last blog post with you, can you tell us a little about yourself? Kate Koconis: Hello! Let me introduce myself, my name is Kate Koconis. I am the sole person responsible for Little Black Sheep Studio. I design and make everything out of my home studio in Providence Forge, VA. As long as I can remember, I’ve been interested in making things. I grew up doing every arts and crafts project you can think of and was especially drawn to the fiber arts. I kept coming back to yarns, fabrics and other very tactile materials. When I discovered weaving, it was a game changer, I fell in love with the craft immediately. I loved every step of the process, I loved the materials, I loved the finished product, I loved everything about it. I’ve now been weaving for over 10 years, and still enjoy it just as much as that first time. My main focus is hand making fiber goods for you and your home. Handmade items are so special. When someone takes the time and effort to make something with passion and love, I think that shows and makes the item so much more than just a whatever it is. It becomes a memory and a feeling. I get such joy from and have such a love for the things I create, and my hope is for that feeling to transfer through the pieces to whomever is interacting with them. This will be your second workshop at Quirk, the response to your first was amazing. How is this similar and how is this different to that first one? Do you think you’ve responded to the interest level of the community? I was so thrilled with the response to my last workshop. Who knew there were so many people who were interested in weaving? Since that workshop I have had a lot of people asking me when I was going to do another one, and I’m so glad I can help fulfill the desire for those who want to learn. I had never taught a group of people before and it was a little bit daunting of a task, but I loved it. I had so much fun sharing this wonderful craft with people, and I think they had fun too. This workshop is going to be very similar to the last. I’ll be going over the same basic steps and how to’s of weaving. I did learn a thing or two from the last workshop though. Like anything, the more you do it the better you get. I’m excited for this next workshop since I’ve made a couple minor changes to my lesson, hopefully to make things easier and more streamline. I’m also very excited for the advanced workshop where we’ll be going over shapes, and how to get a little more intricate with your designs. Recently you’ve been experimenting a lot in the studio with embroidery and new weaving techniques. How do you decide what projects to focus on, when do you know if something new is working and a direction you would like to follow? This is a tough question, there are so many different factors that go into why I make, and I don’t really have an exact system for the decision. It is partly a creative and partly a business decision. While I love going down a new idea rabbit hole, I also need to consider what things are in demand. For this reason, I usually have multiple things I’m working on at once. I’ll be working on experimental projects at the same time as production pieces. Things get really cool when these two meet. My new embroidery pieces are a good example of that. They started out as me wanting to try something totally new just for fun, and ended up being one of my favorite new pieces. I have a long list of things I want to make and I am checking them oﬀ one by one, it’s just a matter of finding the time. Creatively I get inspiration from all over the place, a lot of the time it has to do with a pattern, a material, or a color. While I’m weaving is when I get most of my new ideas. I’ll be working on a piece with a specific pattern and want to make that pattern with a different material, and vice versa, or I’ll want to blow it up in scale. I am constantly asking myself how I can make things better or more interesting, and that drives me to always be moving forward. I am using very traditional techniques, but I try to keep finding new and exciting directions to take them in. I know I am going in the right direction if I enjoy it so much I want to just make more, and I’m excited to make more. I’ll want to change color schemes and sizes of course, but if I don’t want to change anything involving the materials or process, then I know I’m on to something. It helps if those things sell too, after all this is a business, but me being excited about them is more important. I know if I’m not passionate about a new idea, it’s not going to work out. I’ve had the pleasure to see you at local farmers markets with Amy's Organic Garden, and you’re always doing something within the community, always creating. What projects and businesses are you currently working with that you’re excited about? I’m trying to get out there and get involved with as much stuff as I can. Right now I am focusing primarily on holiday markets as it’s that time of year. I’m participating in more this year than ever before. It’s my favorite time of year, I absolutely love going to markets (farmers markets and craft markets). It is so nice getting to meet and talk with people about my work, and also getting to meet other makers. It’s always so uplifting and enjoyable. Richmond really does have so many amazing talented folks and I am thankful to be able to be a part of this community. Also this year you can find LBSS products all around town. You’ve been able to find my hanging planters at Addison Handmade and Vintage and weavings at Quirk Gallery for a couple years now. This year I have added Rosewood Clothing Co. and MADE which is a holiday pop-up store in Carytown, to my list of stockers. I’m always excited to support and partner with small businesses in town. Richmond has such a wonderful community that supports it’s own, and I think that is really cool. I know I don’t exactly live in Richmond, but I have that feeling of belonging to it that is just really nice. A look inside Rosewood Clothing Co. The greenhouse for Amy's Organic Garden that grows and sells vegetables, small fruits and cut flowers on their organic farm in historic Charles City County, VA.
What is next for you? Little Black Sheep Studio? As for me, well anything is possible, we could potentially be adding a horse to the list of animals we have (update: we have added a horse). That or baby goats, you never know around here. I also have a few home renovation projects I would like to get done this winter. I’ll be still working with Amy’s Organic Garden of course, so you’ll still be able to find me at the Birdhouse Farmers market every Tuesday in Richmond, and in Williamsburg every Saturday. I love working on the farm, and that is not going to change. As for Little Black Sheep Studio, I would love to get more involved in teaching more workshops/classes around town. That is something I never thought I would like to do, but now I know how rewarding it is and want to just keep it up. I’ll also just keep making, following my whims and experimenting. I’ve had some plans for some new wearables, I may have time to test out this winter, fingers crossed. Lots to do, so little time. To sign up for the workshop give us a call at 8043406036! $50 per participant per class includes three hours of instruction and your very own hand crafted weaving. Introductory and advanced classes are still available, if you have any questions give us a call or you can email us at emily@quirkgallery.com! Look at our event page for more information! Tin type of Clara Cline at Tredegar Ironworks, Richmond, Virginia. As a preface to this post we would like to thank everyone who signed up for Clara's workshop Brush Lettering A Quirk Workshop! We are officially sold out! We look forward to seeing everyone who signed up for the workshop and hope anyone who was not able to sign up will join us for our next workshop. To stay up to date with announcements of new workshops follow us on our Instagram! Clara Cline: Sure! My name is Clara, and I'm an illustrator and letterer living here in Richmond. My work is generally pretty focused on natural history, so it ranges from wildlife, to maps, to more ephemeral curiosities that I come across. Outside of work my interests are pretty much the same - I love spending time outdoors, combing through antique stores and museums, and I'm a little bit of a packrat - I can never get enough of old stuff. Quirk Gallery: How did you start doing brush lettering? Clara Cline: When I first began illustration as a livelihood I started out with a line of greeting cards. Because I was on a shoestring budget and I didn't like any of the fonts I had on my computer, I started lettering the words on the cards as a workaround. I ended up becoming really captivated with the art and science behind lettering, and brush lettering is a particularly unique challenge and in some ways exception to the normal rules of lettering. It's a lot looser, more expressive, and shows more of a personal hand than some of the more traditional forms of lettering. I can get caught up in the structure of letterforms, so practicing brush lettering is a good way to loosen things up and get more creative. Quirk Gallery: Your company, The Wild Wander, features illustrations, printed pieces and has a big emphasis on naturally sustainable materials. 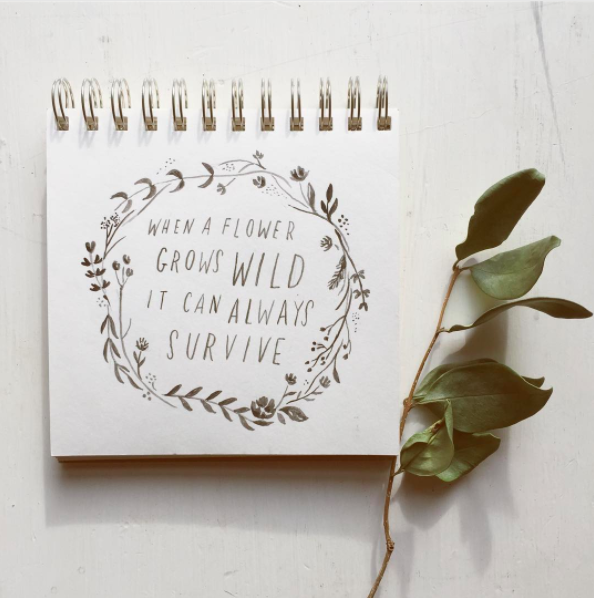 How does brush lettering fit in with your company The Wild Wander? Clara Cline: My work definitely has a nostalgic bent to it, and hand lettering is a huge part of that. When you look at old signage, old advertisements, it was almost always hand-lettered by someone, and it gives a unique characteristic to the letters that you simply don't get with type. Quirk Gallery: Prints and towels like Flora and Fauna show you drawing from agriculture and wildlife of Virginia. What are other inspirations for your work? Clara Cline: I feel very lucky to live in Richmond because there's no end of inspiration around me - from the landscape to the history, it's just a really rich environment. I sometimes feel like I'm a little bit all over the place in where I pull inspiration from, but I think there's some continuity in that it usually stems from a love for antiquity. In Victorian times there was a huge surge of interest in natural history and the sciences, and it became a popular hobby for amateurs to keep little collections of artifacts and catalog phenomena. I think that's probably the most accurate description for what I do - it's grounded in an appreciation for science and history, but curated in a more whimsical way. A hand-illustrated letterpress chart detailing flora and fauna native to the Great State of Virginia. Quirk Gallery: What is next for you and your business? Clara Cline: I have a one year old daughter so that's definitely changed things quite a bit for my work! I'm still in the process of learning how to work with a toddler, but in many ways the lack of time has given me more focus and direction with my work. I've started to return to more detailed paintings and illustrations, which I haven't done in a long time, and I've been working on a series of sort of Audubon-inspired watercolor birds. I'm always looking to stay inspired and keep adding to my body of work, and hoping everything else follows. An original illustration of a cardinal perched on a dogwood branch. Thanks to everyone who signed up for Clara's workshop Brush Lettering A Quirk Workshop! We are officially sold out! We are so pleased to welcome back Clara Cline for Brush Lettering: A Quirk Workshop! Join Clara Saturday, November 18th from 2 PM - 4 PM for her second brush lettering workshop with us. In this workshop Clara will go through the fundamentals of creating great lettering and teach tips and tricks for working with brushes. From Clara's Instagram The Wild Wander: I don't post quite as much lettering content on here anymore, but it's still very much the bread & butter of my work, and a subject I'm excessively enthusiastic about, so I'm very excited to be teaming up with Quirk Gallery to host a workshop next month on the fanciful, emotional, and personal world of brush lettering. No experience is necessary, and it's a great opportunity to brush up (SORRY) on lettering possibilities before the holidays - think place cards, gifts, holiday cards, and more. Materials will be provided, there are a limited number of seats so I can get plenty of one on one time with each participant. I hope you'll join us! Hard to believe this summer's more than halfway over! Here are some of the tunes we haven't been able to stop listening to. We suggest this as the score for your next indoor/air-conditioned dance party or hangout sesh. Kate Koconis is the creative mind behind Little Black Sheep Studio. She makes handmade goods from her home to yours; weavings, hanging planters, pillows, blankets and more. Kate's weavings have been a staple of Quirk's store for the past year and we are so thrilled to host her for her first workshop! We sat down and talked to Kate about her life, studio and the upcoming workshop. Kate Koconis: I am originally from Wisconsin, and moved to the East Coast to attend school at MICA. That is where I officially learned how to weave. I grew up playing fort with my moms large rug loom, but that was the extent of my use of our family heir-‘loom’. As soon as I could, I signed up for a weaving class, and I loved it immediately. I knew I wanted to do something with the fiber arts, but until I took that first weaving course I wasn’t sure where fibers would take me. I only stayed in school for a couple years, but I managed to take every weaving course they offered, some twice. The rest is history, I’ve been weaving for over 10 years now. A new job for my now husband is how we made the move to Virginia 7 years ago. We bought our first house 4 years ago and I was able to finally put together the perfect studio space for myself, so I could start to grow Little Black Sheep Studio. Quirk Gallery: In your weavings you typically use natural materials, where do you source these materials and what is the importance of using natural vs. synthetic? Kate Koconis: I prefer natural materials to synthetic materials, but I do use both. Depending on what I am making will determine which materials I’ll use. When I am making a scarf, blanket, or something that is going to be in contact with you, I choose materials based on how they feel and what they are made of. I use a lot of alpaca wool, sheep wool, cotton, and linen. When I am making a wallhanging, or something that is intended to be viewed, I’ll choose materials based on what they look like. I still prefer natural materials when working on a wallhanging, and mostly use blends of cotton/nylon and wool/acrylic. The only time I use fully synthetic materials is when that material is glittery. I’ll always find some excuse to use glittery things, and there is nothing natural about glittery ribbon. My yarns are from all over. I can’t go to a craft store without walking out with an armful of yarns. I’ve found yarn in antique stores, and flea markets before. I also use online sources like Etsy and WEBS, if I find a yarn and I like it, I’ll scoop as much of it up as I can. Quirk Gallery: Where did your use of traditional weaving techniques come from? Kate Koconis: I use traditional weaving techniques because I don’t think there is any other way to weave. Even with the big computerized looms in factories the general concept is the same, it’s just a computer doing the thinking instead of a human. I think it is important to remember the skills/crafts of our past, and to not forget that we can make things with our two hands that are just as good, if not better, than a big computerized machine. One of my favorite things is when I surprise someone when I say everything in my store I made by hand. We live in a world now where the hand craft is being forgotten as a valuable skill. There is a shift happening where more and more things are becoming mechanized, and I don’t want to see these incredible skills we have be lost. There has been a definite growth in the handmade community more recently, and my hope is that it continues to grow. Quirk Gallery: Can you talk about the value of a handmade object and the relationship between you, the maker, and the customer who brings this piece into their home? Kate Koconis: Handmade to me means quality. I think when most people hear the words “craft fair” they don’t necessarily think quality goods. I want to change that thinking. When you buy something that is handmade, you are getting so much more than just that item. Hand making something takes longer and usually is harder to do, but you can see the time, energy, and care someone took to make it. I get so much joy out of making, and I get even more joy when I see someone fall in love with something I’ve made. Everything I make has a memory and joy attached to it and I hope that joy goes home with the item. I think there is more care and planning on the customers side also when choosing something handmade. Obviously I want customers to buy from me, but I want those customers to feel good about their purchase, and be excited to get it home and display it. Quirk Gallery: You incorporate succulents and air plants into hanging planters, nests and even hanging weavings. Why create spaces for these plants in your weavings? Kate Koconis: Adding plants to my work was an of course kind of moment. I have always loved gardening, and farming, and plants in general, and it just seemed all too perfect to add them into my collection. I love being outside and being in nature. There is a calm and ease of being when surrounded by nature. I think it is important to bring some of that ease of nature into the home. I like to create peaceful cozy environments, and adding plants to the equation seemed like a no brainer. Plus I have a slight plant obsession. Quirk Gallery: This will be your first workshop teaching weaving, what inspired you to share your process? Kate Koconis: Wanting to share my craft with others goes back to this feeling I have of it dying away. The more people I can get interested in weaving the better the chance it has to stay alive. Even if all you’re doing with it is using it as a relaxation tool on a Wednesday night after a bad day. Or making gifts for your family. Or even if you love it so much you choose to turn it into a business, all of these options are keeping weaving going and not just in the history books. Thankfully we have had such a lovely response to Kate's workshop that both dates have sold out! If you were interested in attending this workshop but were not able to secure a spot, sign up for our mailing list to get updates about future workshops! 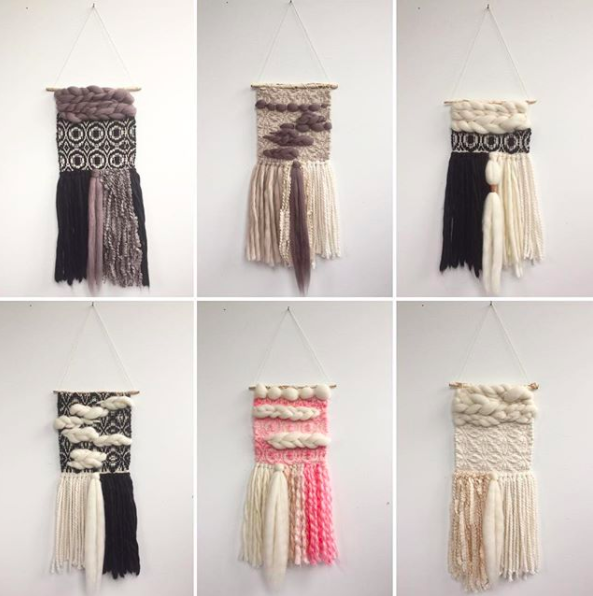 If you are interested in purchasing one of Kate's weaving, stop by the shop to see her beautiful pieces. There are still spots available for our July workshop, Felting Workshop with Nastassja Swift.